Black, White, and Very Bright. This nursery was designed for our son Owen. I am very opposed to spending a ton of money on a baby's room, however, I'm also very opposed to boring nurseries as well. I call it "nursery in a bag" look. I hate the matchy matchy themed rooms you can get at any baby store. 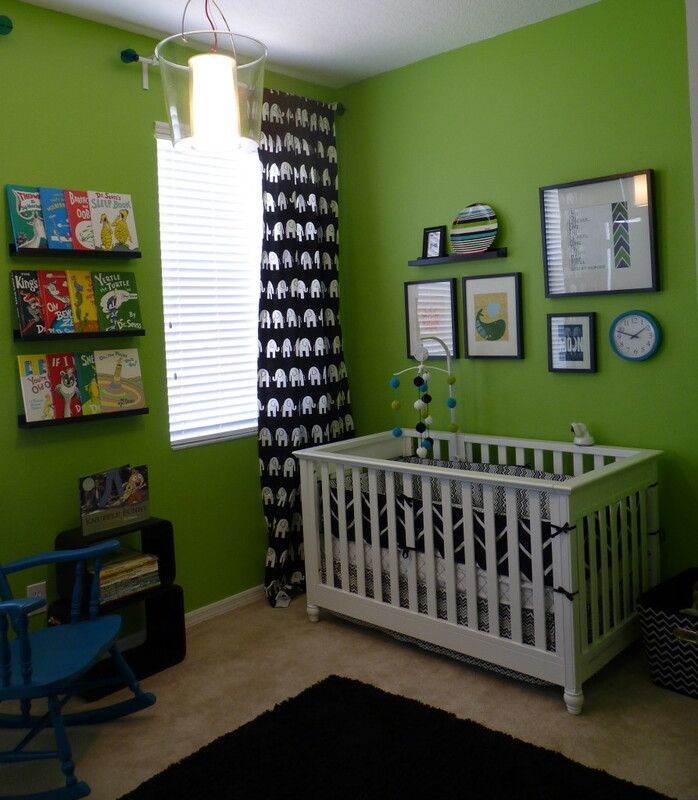 Therefore, we met in the middle and were able to come up with a very fun, bright, and budget friendly nursery. My inspiration for the nursery was the bedding. I love the contrast of black and white, so when I found this bedding (and on clearance no less) I had to have it. The black and white chevron is a fun print, but I wanted to include other patterns as well. I loved the elephant fabric the moment I saw it! There is also a black and white diamond eye fabric I used to make a pillow for the rocking chair. Unfortunately, I haven't had time to photograph it yet. My style is bright, fun, simple, and modern. I love design that is unexpected and not typical, especially in a nursery. Ikea is one of my favorite places. Its furniture is perfect for someone like me because I like to change things out fairly often and when you didn't pay much for it, it doesn't hurt as bad to get rid of it. The book shelves, dresser, tall white shelf, curtain rods and frames are all ikea. We didn't want your typical, run of the mill crib, but we also didn't want to spend a bundle. I'm not a fan of purchasing items I cannot see or feel so this presented a challenge as well. This crib was purchased at BabiesRUs for $200 on clearance. I was also lucky enough to score some super cheap clearance bedding as well. The bedding is from the Missoni for Target line. The pieces were being discontinued ($50) and unfortunately the fitted sheets were already sold out so I was able to find something else that worked. DIY projects include the painted rocking chair ($40 on craigslist), curtains ($60 fabric.com), mobile (free, plus yarn from my yarn stash), and ABC wall art ($30). Lastly, the lovely wall prints came from etsy.com. I have a lot of favorites about this room, but I definitely love the mobile and ABC wall art the most. My advice would be to not settle for the "nursery in a bag" look if that's not your style. Yes, it is definitely more work to search for items and come up with your own design, but in the end you'll have a very unique and personalized nursery, plus you'll most likely save some $$$ too! I really love how you didn’t go with traditional colors- the green, black and blue are so cool. You did an amazing job and I agree that elephant fabric you used for the curtains is a show stopper! I love it!! What is the paint color? Your son’s room looks great! Any instructions on how you made the mobile or the black & white alphabet artwork? Also where you got the prints from above the cot? Fantastic room, full of personality! **To make the mobile, I crocheted yarn balls and connected them with yarn before hanging them from an old mobile that I stripped of its fabric and existing decoration. **The ABC art was made using a large canvas and wooden letters I purchased at the craft store (with 50% coupons of course!). Then I taped off for the stripes and spray painted the letters before using hot glue to attach them to the painted canvas. **The prints are purchased from a shop called leesaralou on etsy. She was wonderful to work with! Where did you get the cute chevron baskets? I’m in love with this room :) My son’s room is this color already and I’m wanting to switch it up. I’m loving the fabric and the chair color! Chevron baskets are from the oh so wonderful Target. But hurry, they are already running low in stock at the Targets in my area. What color did you use to pain the chair? Was it spray paint? i want to paint my room *that* exact color? where did you get the paint and what is it called? Hey there. I love the nursery. I want to do a room with the same green. I actually picked a dark dark blue for accents. And really that’s what I thought you had until I read it. It sorta looked like that too me. :) At least now I can say I did not copy you exactly. (Although I was intending to, hahahaha) Anyway can you tell me the name of the paint color??? What is the paint color/brand of the chair and the walls? Exact colors I am looking for! I'm a soon-to-be first time mom to a little boy named Owen.